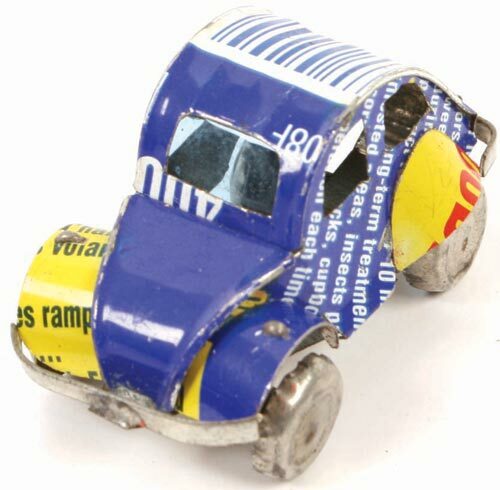 One of our most popular ranges, these models are all hand-made from recycled tin cans by a co-operative in Madagascar, they have been in operation since 1994. They have 18 workshops which provide Fair Trade employment to formerly impoverished artisans in crafts such as weaving, woodwork, bone carving and modelling recycled tin cans, called “Kapoaka” in Madagascar. Each figure is hand-made using old drinks, beer, air freshener cans etc. Each piece of material is hand folded, cut and soldered together to create a magical car, bike, boat or even plane. With the profits generated by these workshops, the Kapoaka artisans have been able to improve their houses, bought nice fields and have established pig breeding farms. Things which they would never have been able to do otherwise.